After many years of struggling with too little cash, the CIP engine project will soon be funded by two very wealthy men. These men want units that can lift 100's of thousands of pounds. Some of the units will be used for logging operations all over the world. Movie and T.V. Deals are still on the burner. The T.V. Documentary has been started and should be finished before the end of this year. A movie “trailer” is being prepared to raise money to do a full length movie on The Life and Times of Robert Cook. A “Trailer” is a sample of what the movie will be like. This probably will happen in 2008. Robert Cook discusses his Propulsion System (known as the CIP engine) with scientists from The Jet Propulsion Lab (JPL) and Northrop Grumman. The event was recorded by 3 cameramen from the Hollywood studios of Roman Coppola (son of movie producer Francis Ford Coppola) who is doing a TV Documentary on Robert Cook's invention. The main discussion centered on why America's aero space companies have not gotten into developing this propulsion system that can be used to propel all types of Air, Sea, Land and even Space vehicles. It will greatly reduce our pollution! John LuValle, (a space scientist from JPL) believes this CIP engine could prove to be the most efficient propulsion ever invented. He spoke very highly of Cook's inventive abilities. He hopes the U.S. Scientists will soon help to fully develop this idea. David Stephens, Senior Staff Engineer for Launch and Operations of Northrop Grumman Space Technology, (who is a Rocket Scientist and expert on Communication Satellites), and knows the Cook Propulsion system very well, also spoke very highly of what he called Cook's “ingenuity” in developing His “Mechanical Rocket”. He will try to get some help for Cook to develop his idea. He has no doubt that it works, because he has seen working models and He knows of the successful series of tests (of one of the CIP engine models) conducted by Boeing Aircraft engineers. Only Stephens' peers (who have never bothered to study the plan) have prevented Northrop Grumman from getting involved in the development of this great invention! Everyone at this discussion came to the conclusion that the NIH factor is alive and well in the U.S. Scientific and Engineering Circles. “NIH” stands for “Not Invented Here” and this factor is created by envy and jealousy on the part of the Professionals when they hear about this idea, which they wish they had invented! A TV Documentary on the CIP engine has been started by a very well known producer. Interviews of scientists have already been conducted and the Hollywood people have been impressed with the comments of these professionals concerning the Cook invention. Until they interviewed the scientists, they couldn't believe the Cook invention (CIP engine) was for real. The Documentary should be ready in a few months. Other Hollywood movie producers want to do "The Bob Cook Story". Several of the most outstanding movie stars are being considered to play parts in the movie. The movie script will be written by a very famous writer. This movie probably won't be ready until next year. The producers who read the book "The Death of rocketry" and saw the DVD of Cook's talk at Laughlin, Nevada (recorded in Feb. 2006) said this was a real Hollywood story. There seems to be more then one producer interested in doing "The Bob Cook Story"! Cook has been asked to modify wide bodied jets to fly with CIP engines. These jets will be flying hospital ships capable of flying to anywhere in the world in 3 to 4 hours! They will cruise at 3 to 4 thousand miles per hour! Powered the old fashioned way they only cruise at around 650 mph. These next 2 years should be the busiest times for Cook and his associates. Modifying the jets is a very difficult task, but there are many engineers that want to be a part of this very exciting work. The government of one foreign country has agreed to provide funds to the tune of One Hundred million dollars to develop several new promising invention's, one of these inventions being the CIP engine! Along with these funds several insurance companies have agreed to put up matching funds of One Hundred million dollars to make a total of Two Hundred million dollars in funds available to develop some of these life saving inventions. The funds will soon be in the bank for use by these various investors and a CIP flying unit would be ready to fly in the near future. The contracts are already signed! A movie maker wants a CIP propulsion unit designed and built for a science fiction movie. This is a one million dollar deal. A documentary film has already been started which tell the story of Robert Cook and the history of the CIP engine. It will probably be shown next year on TV. Another movie producer wants to do the complete story on the life and times of Robert Cook. This movie will probably be two years in the making. A six rotor CIP unit is now about 90% complete and should be ready for testing in the next few weeks. This unit should be capable of developing a “constant force” and with the “propellant mass” recycling system, will be able to run continually without having to stop and reload the weights. Many foreign nations have taken a great interest in the CIP engine and have sent their representatives to investigate this different propulsion principle. They have all been very impressed with the model demonstration. There is a total 7 different nations' involved. Some of the representatives of these different nations are shocked when they find out the U.S. government has ignored this great fuel saving invention. I have reminded these people that the U.S. has an oil based economy and they don’t want my fuel saving system because it will cut into their oil profits and they don’t care about the damage the oil burning is doing to our planet. I was recently approached by the son of a very famous movie producer who wants to do a Television documentary on my work. They have already filmed interviews of some of the professionals who have tested and done studies of the CIP Engine principle. These professionals are the most outstanding in their fields and the Hollywood people were amazed at what was said about me and my work. The documentary should be ready sometime in 2007. After several years of looking for funds to build a new and improved CIP prototype, Robert Cook has found several different groups who have offered to fund several different projects. These groups are all from foreign countries and have shown much admiration and respect towards Robert Cook. One of these supporters is an expert on Quantum Mechanics and is also a brilliant mathematician. He has seen the CIP engine working model and he as well as others (who have seen the model work) wonder why America has not helped in the development of such a great energy device. Many Americans have come to see the model and have tried to “pick Cook's brains”. They think it’s an easy thing to “reverse engineer” this invention and run with it. Work on the design of the new system will probably begin sometime in September of this year. This will be a unit that can fly and also propel wheeled vehicles. This technology will be presented to a scientific symposium in Belgrade, Yugoslavia sometime in October of this year. This publication is printed in New Delhi, India and has some very outstanding writers from all over the world. They have some very sobering advice for the world. “The extraction of a very large proportion of the oil and gas deposits of our planet may be partly to blame for the increase in the number and intensity of earthquakes and for some other natural disasters recorded in the last few decades. This article contains 8 1/2 pages of some very shocking evidence on these subjects. Robert Cook gives what was accepted (by his listeners) as a very interesting talk regarding the last ten years of his work on the CIP engine. The talk was given at Laughlin, Nevada on Feb. 28, 2006. Many people came to give their congratulations and good wishes and expressed their surprise at what Cook had been through the last 10 years. They said they were either near tears or busting with laughter over what was said. They liked Cook’s way of expressing himself. In Nov. 1999 Cook took a model to the Boeing Phantom Works and after 2 days of testing, it was concluded that the test results showed there was NO reaction force. This put the invention in conflict with Newton’s 3rd law of action, reaction and Wallis’ Conservation of Angular momentum law. A Cavendish Torsion Pendulum test also showed positive results! It’s the same as a swinging Pendulum. Cook was able to work out a new math formula by modifying the J=Iω equation. All top scientists who have been introduced to the new math have admitted this formula proves why the CIP principle works! The people who heard this talk were very happy to hear the good news, because it means we can have a better way to travel on water, land, air and space. We will soon be able to colonize the moon and planets! Cook hopes to give at least 4 public talks per year. Robert Cook to speak at the 15th Annual International U.F.O. Congress Convention and Film Festival at the Flamingo Resort in Laughlin, Nevada on Feb.28 starting at 8:30 am. This resort is located 90 miles southeast of Las Vegas. This will be Cook’s first technical talk on the CIP engine since 1995. He had decided not to say anymore in public until he could dogmatically say that the CIP principle had been proven beyond any doubt. In December of 1998 a series of 3 tests would be started on one of the CIP working models at the Boeing Phantom Works. The December 1998 test showed some very interesting results and Cook was invited to return after making some improvements on the model. Another test was conducted by Boeing in May of 1999. The final testing was conducted in late November – early December 1999. The major test (which took 2 days) using a “Load Cell”, proved that the model was producing a “Unidirectional Force! For over 300 years the world of Science had been telling the world that “Unidirectional Forces” were impossible to create because of Newton’s 3rd law and John Wallis’ Conservation of Momentum laws. Two articles about the Boeing test results were published in Infinite Energy Magazine in 1999 and 2000. Another article on this was published by Jane’s Defence Weekly in July of 2002. As a result of this successful “Load Cell” testing, Cook was challenged to do a “Pendulum Test”. Because this was an incomplete model, (it didn’t have enough rotors to produce a constant force) a “Cavendish Torsion Pendulum” was used to successfully prove that it could propel. For every 6 impulses the unit propelled 4 to 8 inches. This proved the CIP principle beyond a doubt! This is why Robert Cook can say to the people, “A new Revolutionary Propulsion invention is here and now”. After being reunited with Eduardo Nuñez, an old friend of the CIP Project, Robert Cook was invited to give a speech in West Hollywood at the Bodhi Tree Bookstore regarding his work and endeavors to pursue his groundbreaking work. The lecture was well received by all in attendance and Bob feels this was an important milestone for the CIP project. In attendance were many people who share our concerns about the environment, and some notables who may be able to help further our cause. You can read Bob's most recent commentary about the event- Visit to West Hollywood. After conducting several months of experiments on a new clean energy source, Robert Cook has solved the last problem that was preventing the new system’s success. Sometime before the end of 2004 this new system will be presented to the world. It will be a revolutionary invention. The CIP engine has also been successfully tested on a Cavendish Torsion Pendulum. Several months of testing on the pendulum proves that the engine is producing a unidirectional, internal, reactionless force. The scientific community wanted the system tested on a regular swinging pendulum, but this could not be done because the system as constructed only produces an impulse and not a constant force. The torsion pendulum proves the same thing that a test on a swing pendulum does. This system will eventually produce a constant force and will be able to levitate but this will require a 12 to 16 rotor unit. The test model only has 2 rotors, that is why it can only produce an impulse and not a constant force. Many scientists and engineers that have seen the pendulum tests have declared it a big success. Many have admitted they would not have believed it if they hadn’t seen for themselves what the unit can do. There is a possibility that a CIP unit may be featured in a science fiction movie sometime soon. Business negotiations are taking place now, but it is too soon to tell what the final outcome will be. In a letter dated October 30, 2003 addressed to Kofi Annan, United Nations Secretary General, a top businessman from the nation of Kenya requests that the U.N. grant Robert Cook 7.5 million dollars to build several prototypes of his 3 different inventions. Several African nations have expressed an interest in the 3 inventions and it’s possible they may get involved with this work in the near future. On Tuesday, September 24, the inventor of the CIP engine, Robert Cook, was on the "Art Bell Coast to Coast" radio talk show. The inventor talked about the CIP engine and his thoughts on the environment, among other things. His appearance on the show was a great success. The response he has gotten from the public has been completely positive, and he has received many monetary contributions and orders for his book, "The Death of Rocketry" since the show aired. He has also made contact with people who may be willing to fund the project on a larger scale. We greatly thank George Noory for being a great host and keeping the show moving along smoothly. The Art Bell talk show is now "Coast to Coast AM with Geroge Noory". Information can be found at www.coasttocoastam.com. July, 2002- CIP Engine Mentioned in "Jane's Defence Weekly"
Read the article that came out in Jane's Defence Weekly of 7-24-02 discussing current breakthrough propulsion devices. The CIP engine is mentioned among other devices. Read about it in the article, Air Power Electric, by Nick Cook which has been reproduced with the permission of Jane's Defence Weekly. The CIP engine has finally been fully (and successfully) tested on a Cavendish Torsion Pendulum. This test was suggested by Dr. Robert Bass last year. The complete apparatus weighs a hefty 2,000 pounds and is possibly one of the largest Cavendish pendulums ever built. It converts centrifugal (rotational) force into a linear (straight line) force. The unit tested is a two rotor system capable of producing about one inch of rotation of the pendulum for each two pound impulse. This is not a complete system and is therefore limited to 6 impulses (per test) which makes the pendulum rotate about 6 inches. These impulses are similar to artificial gravity. The 2 rotor model was originally designed to be composed of 16 rotors and capable of generating a constant force in the 20,000 pound range. Lack of funds prevented the 16 rotor unit from being developed. The tests prove that a unidirectional, reactionless, internal force has once again been demonstrated. This means that Newton's 3rd law of motion as well as John Wallis' "Conservation of Angular Momentum" law (claimed by Sir Isaac Newton) have been found wanting! Perhaps now science may decide to check out my discoveries like the many professionals who have tested some of my other models in the past. The former successful tests have included: testing on water, air bearings, accelerometer test, load cell test, and computer simulation. This Cavendish Torsion Pendulum is the latest and final test. The only other thing we can make it do is fly! This will require at least 12 rotors and the cost will be in the $250,000 range. We are hoping a conscious philanthropist will provide the funding. Attempts to develop the idea through a limited partnership and private trust have only resulted in ugly court battles when the associates became extremely greedy and tried to steal the technology. It is estimated that if the right people had gotten involved 20 or 30 years ago and the system was fully perfected at this time, 10 to 50 thousand lives a day (mostly children) could be saved from a miserable death. If fossil fuel burning is really the cause of global warming, then by utilizing this new propulsion system and its spin-offs would prevent the ultimate disaster which would entail global earthquakes which will be triggered when the polar ice packs completely melt off. To understand how this will happen, read The Cause of Most Earthquakes and Bad Weather on the website. We don't have the luxury of time to argue about all this because the warning signs and their causes are there. A word to the wise should be sufficient. If you as an individual can help us out, please join us in finishing this life saving work. The preparations for the CIP torsion pendulum test are almost complete. The preliminary tests conducted so far show favorable results. The testing conducted recently was witnessed by a certified mechanical engineer and a physicist. They were so favorably impressed by what they saw that they have offered to help the project by contributing load cell testing equipment to do more comprehensive tests to prove that the CIP engine is a true reactionless unidirectional force system. After seeing the demonstration, these two gentlemen (the engineer and the physicist) were able to see ways to improve the performance of the CIP unit attached to the pendulum. This improvement on the pendulum demonstration required the addition of a thrust bearing for vertical stress on the pendulum arm and also the addition of another bearing to take care of some of the horizontal forces which were causing the pendulum to pitch fore and aft. Testing shows the addition of these two bearings has improved the pendulum testing results and with the addition of the load cell testing equipment all bases will be covered. Any scientist or engineer seeing the results of these two different testing methods (pendulum and load cell testing) should be convinced by one or both methods that the principle the engine is based on has been satisfactorily demonstrated. Future results of the next series of tests will be posted as they are conducted. After several months of building a massive torsion pendulum that weighs about 2000 pounds (one ton) and reworking the electrical system of the CIP test model, testing is to commence on September 26, 2001. This will be the most thorough testing ever performed on a reactionless drive and will prove beyond doubt that the Cook Inertial Propulsion system works! Several scientists and engineers will be invited to witness this testing sometime in the next few days. Results of the testing and the comments by the experts will be posted on this website at the time the testing is completed sometime in early October 2001. The preliminary testing of the improved model has so far been awesome! For the past few weeks, the CIP prototype has been fine tuned for testing on a Torsion Pendulum. This test has the CIP prototype suspended on one end of an arm with an equal amount of weight to counter balance it on the other side turning on the axis of a coupling floating on a thrust bearing. It takes approximately 2 ounces of force to overcome the friction of the bearing. This testing, though not complete, has already shown two things. The first being that there is no negative kickback to speak of when the weight is pulled on to the rotor, or removed from the rotor. The "load cell" test (which was conducted by Boeing personnel in November and December of 1999 at Seattle, Washington) also indicated that there was no recoil or reaction forces produced by the weight exchange. This is contrary to Newton's 3rd law and Wallis' "Conservation of Angular Momentum" law. Engineers that did the 1999 testing calculated that at the speeds the model was turning for that series of tests, a 90 pound negative impulse should have registered each time the weight was exchanged by the rotors. But because of the great significance of what a lack of reaction force means, the testing must be performed completely and accurately to be proved beyond any reasonable doubt. Once proven to be correct, the CIP engine principle would shatter the foundation of physics and mechanics as written by Newton and Wallis over 300 years ago! The testing so far shows these teachings to be "hanging by a thread". The second thing we have seen with this test is that the CIP prototype has moved forward when the weights cycle around the front half of the machine. Yes... that means it has passed the test. Again, the results aren't complete at this time, but when the machine is fine tuned it should pass the test in a completely conclusive manner. This site will be updated at such time. Bob has recently had to move from Guadalupe, California to Taft. This move was brought about due to the selling of the house he was renting. This move has been a setback to the CIP project, and Cook needs help now more than ever. If you feel you could contribute in some way to the CIP project, by all means contact Bob Cook using any of the contact information at the side of this page. Bob Cook appeared once again in Infinite Energy magazine, volume 5, issue 29. If you would like a copy of this issue, this can be done from their web page: www.infinite-energy.com. This article is an update of Cook's most recent visit to Boeing and their successful testing of the CIP engine. The model of the CIP engine connected to the load cell at Boeing. The Cook Inertial Propulsion engine was taken to Seattle Washington for testing by the Boeing corporation on a load cell beginning on November 29th. Extensive testing was done for three days in an attempt to either prove or disprove the machine. 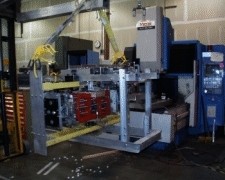 The Boeing crew rigged up a load cell to test the impulse value of the machine. It was decided that a load cell was a much more accurate and thorough way to test the machine than a pendulum test because all forces can be accounted for in a load cell. The first two days were spent trying to find a large negative impulse required by Newton’s third law of action-reaction. This force was never found. The failure of the large negative impulses required by Newton's law of action-reaction to appear each time the weights were exchanged at such a high speed proves that Newton was wrong and a true reactionless force was being proven in its place. However, Boeing attempted to find the CIP’s theorized positive impulse on the third day of testing. The machine successfully picked up a series of 5 lb. weights that day while the main arm of the machine ran at 43 rpm and its rotors spun at a startling 344 rpm! The load cell, however, registered an impulse of 5.73 lb. sec. in the negative y axis when it should have registered positive. This puzzled the Boeing crew and caused them to believe that the CIP engine didn’t work. Cook left that day, perplexed as well, and began to wonder if the load cell was actually the proper system to use to prove his theory. Saturday, after Cook made it back home, he got a surprising call from Boeing. They told Cook that a mistake was made in rigging up the load cell… it was hooked up backwards! As a result, the negative impulse of 5.73 lb. seconds was actually a positive impulse! There were no overriding forces in the system, so the test proved the principle worked. To make a long story short, the CIP engine is proven! Bob Cook appeared in volume 5, issue 28 of Infinite Energy magazine. You can order this issue from their web page: www.infinite-energy.com. The article documents Cook’s two other Boeing-conducted tests of the CIP engine. It is definitely a must have for anyone interested in Cook’s idea or reactionless technology in general. An employee of Boeing Aircraft built a Di Bella inertial drive unit and hooked it up to the same load cell that the Cook Inertial Propulsion engine had been tested on earlier in 1999 and winter of 1998. The Di Bella drive produced a net-zero force. On this same device, the CIP engine produced a positive y-axis impulse. Once again, the CIP engine has proven to be the only reactionless system that actually produces positive results. These are the press releases we've issued since 1999. A scientist from Canada had a few words to say about Bob Cook's invention and the inventor replies to the critique of his work. Bob Cook is contacted by Nick Cook of Jane's Defence Weekly, a publication dealing with global military defense. To print, change the paper orientation in print settings from "Portrait" to "Landscape".